Neenah, WI - With nearly every U.S. business affected by OSHA’s Walking-Working Surfaces Final Rule, pressure is mounting to train employees on new requirements ahead of the May 17, 2017 deadline. 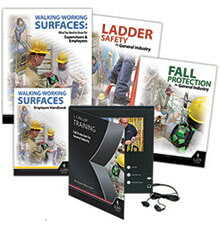 To help general industry employers comply, J. J. Keller & Associates, Inc. has introduced three new, easy-to-understand training programs: Walking-Working Surfaces: What You Need to Know for Supervisors & Employees, Fall Protection for General Industry, and Ladder Safety for General Industry, as well as the Walking-Working Surfaces Employee Handbook. In accordance with the updated standard, these resources help supervisors and employees understand how the rule impacts them, and provide guidance for recognizing and preventing slip, trip, and fall hazards in the workplace. Each training program is available in English and Spanish, and offered in DVD, Pay Per View, Online Course, and Video Training Book formats to help employees get up to speed quickly, no matter their schedule or location. View all training formats and their components at JJKeller.com/120068.